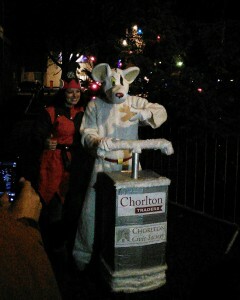 Our Christmas Raffle raised £1,135, which goes towards lighting up Chorlton at Christmas. Big thanks are due to everyone who sold tickets, bought tickets or donated such fantastic prizes. We’ll do it all again next year! Here’s to a brilliant 2015 – not only for our members, but for everyone who lives, works and loves in Chorlton. These are words we’ve been hearing quite a bit, perhaps most notably in the Evening News a while back when it reported on what became known as Quinoagate. In case you missed it, this was a story in which the team at Unicorn mistakenly labelled their stock of quinoa as organic, then put up a note to apologise. ‘Only in Chorlton,’ or ‘That’s SO Chorlton,’ usually begin or end statements which tread a well-worn path, usually one which features houmous somewhere along the way. I don’t think I need say more. At its best, the Chorlton caricature is good-natured and pretty funny: at its worst, it’s just a little bit boring. So what if outsiders say we’re smug? Nothing wrong with loving where you live: when we’re proud of our neighbourhoods, we make them even better. I think we should reclaim the two phrases for ourselves: subvert them by wearing them as badges of honour. I’ll start now. A village vibe where there’s always something to see and somewhere to play, not to mention a festival calendar of our very own. A place with a real creative pedigree; from Cosgrove Hall to Matthew Williamson, Harry Goodwin to the Bee Gees. Our own village green, a choice of parks and a fat ribbon of countryside on our doorstep. An inspiring and eclectic range of independent and creative businesses from indie crafters to major media players. Great coffee, our own beers and all you can eat: Chorlton-made chocolate, Chorlton-made chutney. Books, art, flowers and a choice of posh olives – available in minutes. Intelligent, socially aware people, who try to shop ethically and care about what’s going on around them.